When you watch the video, it’s actually not as absurd as the headline looks. I mean sure, it’s still pretty absurd. But all it really is is just a staged photo op for some Pat Geary retread who’s gonna drink the milk out here and then squeeze these guys udders pockets dry backstage. Basically everything was fine until he said he’s be proud to and treated it like Michael kissing Oscar to embrace diversity. If he simply says he loves chocolate milk and takes a big swig, then I’m sitting here writing about the return of the NBA tonight. But seeing as politicians are robots that was probably asking too much. 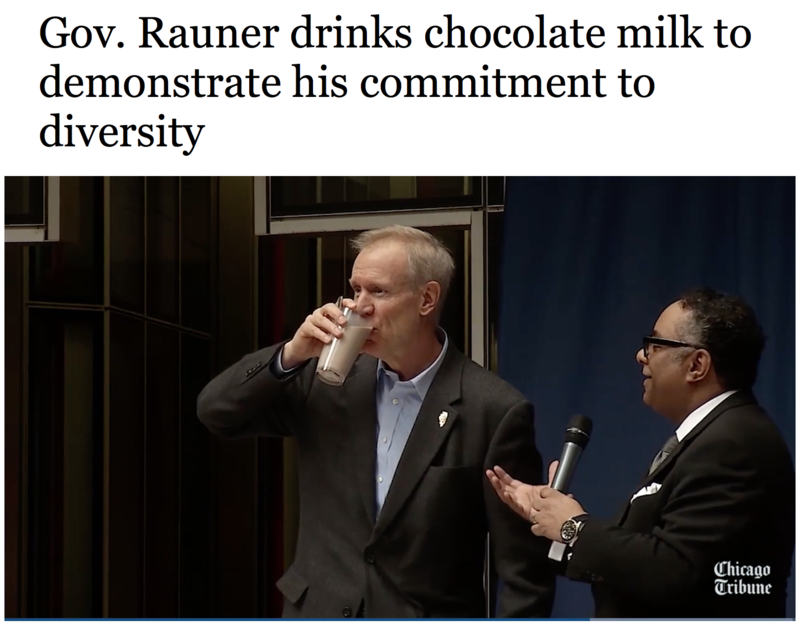 Of course he was proud to end racism drink chocolate milk. It wouldn’t be *checks calendar* February 22nd if we didn’t have another real life headline ripped straight from the writers desk at The Onion. If you take away the Onion-esque headline and Fake Pat Geary’s pride it’s not like the analogy is that crazy. In fact I kind of like it. Chocolate is good. But it falls to the bottom. Gotta mix it up to help it spread. Diversity! It’s clever. I mean it’s not how reality works. If it was then they’d pour the syrup in, never mix it, leave it there, finish the event, and Fake Pat Geary would gulp down half the warm unmixed milk before dipping out the back door and leaving the half drank glass there with the syrup still still at the bottom for someone else to clean up. But conceptually… I like it. Mixing drinks is always better. Chocolate Milk is better than regular Milk – not even the McPoyles would disagree on that. Arnold Palmers are better than regular lemonade – and John Dalys are better than Arnold Palmers. And for the All Lives Matter crowd, yes, it goes both ways. Putting Half & Half in your coffee is significantly better than having it black. In fact, the only thing that stinks more than black coffee is racism. There, I said it. In fact, I hope all the racists drown in a vat of black coffee like Landfill in Beerfest. There, I said it again. Now if you’ll excuse me, I’m gonna go mix my codeine with the sprite and let the day slowly drift away. The NBA is mercifully back tonight. And as you can see these last few days without Hoops have… well I think you’ve gotten a pretty clear picture of how I’ve handled it. Thanks for your time. See y’all in a few hours. Previous Kylie You Know That’s How It Wo– You Know What Nevermind. Congrats!